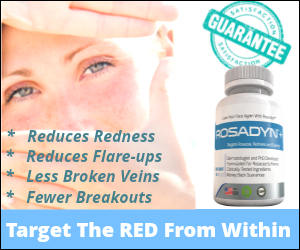 Article Objective: To highlight foods and drinks with strong active extracts that have a direct impact on rosacea inflammation, blood vessel health, vascular overgrowth and skin health. These are collectively referred to as ‘rosacea super foods’ because they have a significant positive impact on rosacea symptoms by acting on the cellular and genetic level of rosacea skin to reduce — and even reverse — inflammatory and genetic abnormalities associated with ocular and facial rosacea. We will detail ten high impact rosacea foods, their mechanisms of action and how best to serve them for snacks and meals. Mung Beans: The mung bean (Vigna radiata), is a delicious green bean derived from the legume family in Southern Europe and the Mediterranean. This bean contains a a powerhouse of nutritious compounds that have potent anti-inflammatory actions. More specifically, flavanoid compounds in the mung bean have two important actions on inflammatory substances that play key roles in rosacea. Mung Beans greatly down regulate inflammation, particularly in the skin. The flavonoids found in the seed coat of the Mung Bean regulate an important protein molecule in the body that acts as an inflammatory switch — HMGB1. HMGB1 activates and releases inflammatory cytokines that have been shown to be one of the most damaging and dangerous proteins involved in rosacea symptoms, rosacea triggers, chronic skin inflammation and rosacea progression. Mung Beans effectively “turn off” this HMGB1 switch, thereby greatly reducing cytokine release central to ocular and facial rosacea. Mung Beans also have potent antioxidant actions which help to reduce the overall inflammatory state of rosacea and speed up skin recovery following rosacea flares.Mung Bean Preparation: Mung Bean Salad for snacks or meals containing 1/4 to 1/2 cup cooked and chilled Mung Beans; Mung Bean soup with 1/2 cup beans added to any soup base. Tart Red Cherries:These cherries, particularly grown in the US North West are perhaps the most over-looked rosacea super foods due to its numerous anti-rosacea actions and ability to reverse inflammatory processes at the genetic level. Scientific and clinical studies have demonstrated that Tart Red Cherries contain very unique bioactive molecules with strong anti-inflammatory actions and impressive blood vessel strengthening abilities. One of nature’s most potent classes of flavonoids are the anthocyanins. These powerhouse nutrients are responsible for the deep colors in some berries, fruits, and vegetables. Naturally, like other anthocyanin-rich foods, tart cherries deliver substantial antioxidant and anti-inflammatory activity. Anthocyanins are very important to rosacea because they help repair, rebuild and strengthen fragile rosacea blood vessels. The anthocyanin content is so high in red tart cherries that even a half dozen cherries taken once or twice a day as a healthy snack has a pharmacological action on rosacea blood vessels. But tart cherries are superior because they provide high levels of some novel anthocyanins that are absent from a number of other anthocyanin-rich foods, such as blueberries or bilberries. Also, the unique composition of tart cherries goes far beyond anthocyanins – these cherries contain molecules that reduce the activity of the “Master Inflammatory Switch in the Skin” – NF-Kappa-Beta. Pure Organic Extra Virgin Olive Oil:Physicians are now recommending that many of their patients take two tablespoons of Extra Virgin Olive Oil with each lunch or dinner due to the numerous beneficial actions on countless inflammatory processes, protection and repair of blood vessels, thinning of the blood (which reduces flushing and signs of facial redness), and clinical studies demonstrating the ability of this oil to reduce the signs of most inflammatory skin conditions, especially those such as rosacea. Pure Organic Extra Virgin Olive Oil Preparation: Simply take two tablespoons of the oil with a meal. You can also dip it into your favorite Italian bread. Bilberry: Bilberry is any of several primarily Eurasian species of low-growing shrubs bearing edible, nearly black berries. The species most often referred to is Vaccinium myrtillussL., but there are several other closely related species. Bilberries are distinct from blueberries but closely related to them. Bilberry is excellent for facial and ocular rosacea due to the high anthocyanidin content that repairs weak rosacea blood vessels. Bilberry also has the unique ability to reduce inflammation deep inside the blood vessel wall through interaction with anti-inflammatory muccopolysaccharides. Bilberry is probably one of the best rosacea superfoods for ocular rosacea because the active extracts have a strong affinity for the retina of the eye and has long been used in European medicine to treat various eye disorders. Bilberry Preparation: As a snack, a handful of bilberries is an excellent choice; these should not be cooked though as heat destroys important active components. Barley Grain:Barley grains are incorporated into many foods and soups. What most people don’t know is that it is one of the single best anti-stress and anti-anxiety natural food available. You already know that stress can cause health problems and most rosacea sufferers rate stress as their top trigger. When you experience stress, your body’s natural reaction is to release the hormone cortisol. In small doses, cortisol isn’t harmful to your health. But if you experience chronic stress, elevated cortisol levels can wreak havoc with your rosacea symptoms and triggers. Phosphatidylserine, a phospholipid located in cell membranes of barley, will help reduce cortisol production in the body and greatly helps many rosacea sufferers control their rosacea triggers and flares. Barley Preparation: As a snack, simply cook half a cup of Barley and eat hot or cold; Barley soup is also an effective and tasty way to eat a healthy dose of barley and counteract the effects of stress on your rosacea. Organic Green Tea with EGCG:Green Tea has long been known for its anti-inflammatory actions on rosacea skin as it calms half-a-dozen inflammatory enzymes within minutes of drinking the tea. Recent research emphasizes the important of EGCG (Epigallocatechin-3-gallate) in your Green Tea… and at doses higher than 50 mgs per cup. EGCG is a potent inhibitor of VEGF, a protein that causes vascular overgrowth (angiogenesis) in rosacea. The main problem with ordinary Organic Green Teas is that they only contain small concentrations of EGCG… or unknown concentrations. At most herb stores you can buy Organic Green Tea with verified amounts of EGCG of 50 mgs or greater. It is very important to drink Green Tea with verified concentrations of EGCG so that you can enjoy your tea and know that you are reducing the overgrowth of blood vessels that is central to the rosacea process. Organic Green Tea with EGCG: Simply brew Green Tea and drink it hot or cold. Two to three cups per day is optimal so that your daily intake is at least 150 mgs total per 24-hour period. Chia Seeds: This might be the hottest anti-inflammatory super food of 2014 because these tiny dark seeds are nutrient dense with amazing therapeutic value backed by scientific and clinical studies. This tiny seed is packed with anti-inflammatory plant based Omega-3 fatty acids . Omega-3 fatty acids help block inflammatory hormones that trigger rosacea flares and stimulate anti-inflammatory hormones that help to keep your rosacea in check — they have long been known (going back to the Aztec days) as being great for your skin and hair. Chia seeds are also rich in antioxidants that help fight rosacea’s defect in the skin’s antioxidant defense system which is key to rosacea remission. More specifically, Chia seeds are rich in flavonols and polyphenolic acids, quercetin, myricetin, kaempferol, and caffeic acids that are powerful antioxidants, anti-inflammatory and promote vascular health. Chia Seed Preparation: You can literally add Chia Seeds into any food source and drink. Try adding them to your shakes, smoothies, salads, and baked goods. Red Grape Seed Extract:Red Grape Seed Extract from the South West are excellent super foods for rosacea sufferers. They have three primary actions that are key to addressing the heart of the disorder. These grapes have a myriad of anti-inflammatory actions that help to calm the overzealous immune system often present in rosacea-affected skin. This is important as this immune response will not dissipate without intervention — such as grape seed extract mobilization. Grape seeds also contain high concentrations (95%) of proanthocyanidins, powerful blood vessel strengtheners that can reverse vascular fragility common to rosacea. Thirdly, grape seed extract is a potent inhibitor of VEGF, the protein that causes chronic vascular overgrowth and makes it nearly impossible to beat this inflammatory skin condition. 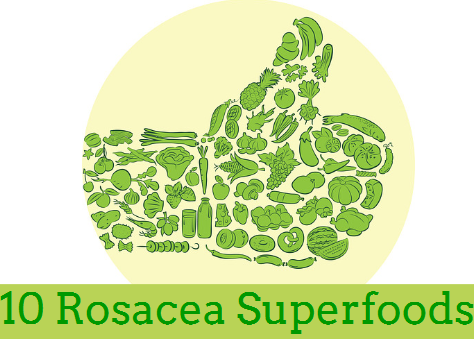 These three factors make grape seed extract a must-have on your rosacea super food list. Red Grape Seed Extract Preparation: Eat a handful as a tasty-healthy snack; whip them up into a fresh juice and drink at your leisure. Reishi Mushrooms: Over the past several decades, scientific research has intensified and focused on analyzing the hundreds of unique bio-active compounds found in the medicinal Reishi Mushroom. Just this year alone, three new compounds were discovered. With each new finding, intriguing medical applications for Reishi have emerged. In regards to rosacea, the immune system in the facial skin is completely out of balance in every rosacea sufferer. Every single one! The inflammation from rosacea signals (erroneously) to skin’s innate immune system that it is under attack. In response, the body sends countless immune cells to the skin to destroy these cells, but this response only makes the inflammation and damage exponentially worse. At the same time, the immune system that “calms” down this vicious cycle is turned off. The Reishi mushroom helps to restore balance to the immune system and send repair enzymes, proteins and peptides to every layer of skin to start the healing process. This is one of the best things that a treatment (natural or prescription) can do to reverse rosacea symptoms, rosacea triggers and stop rosacea progression. Reishi Mushroom Preparation: Reishi Mushrooms can be eaten cold or hot in any type of dish. Pomegranate Fruit Seeds: Phytochemicals from fruits such as the pomegranate (Punica granatumL) are strong antioxidants and anti-inflammatories that are now used routinely in Naturopathic Medicine. Recently, medical studies have shown that Pomegranates primary active ingredient — Punicalagins — is one of the strongest natural inhibitors of Tumor Necrosis Factor Alpha (TNF)…. which also happens to be one of the top three most destructive proteins implicated in rosacea. TNF destroys skin cells, vascular cells, nerve cells and simultaneously releases an onslaught of free radicals that leaves rosacea skin in total disarray. Punicalagins ​ from Pomegranates are as powerful as many pharmaceutical prescription drugs used to block TNF. Needless to say, Pomegranate is indeed a super food for rosacea and can make a difference in rosacea flares and severity in a matter of days. 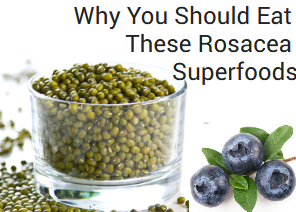 While this may be listed as #10 on this blog article, it may indeed be #1 in overall importance and the top natural super food for rosacea currently available. Pomegranate Preparation: You can eat Pomegranates whole as a snack; you can also drink Pomegranate juice with a known percentage of Punicalagins; to release the highest concentrations of Punicalagins, you can simply put the tiny Pomegranates and blend them — then whip them into a delicious smoothie.